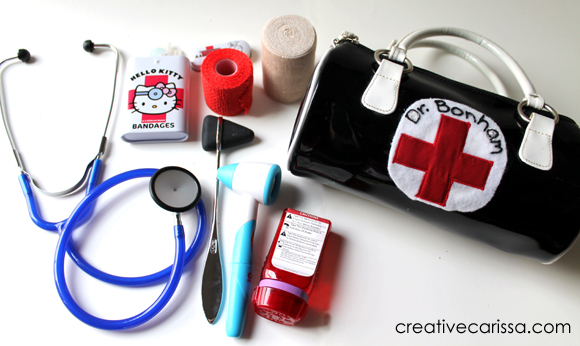 Why make your own toy doctor kit? 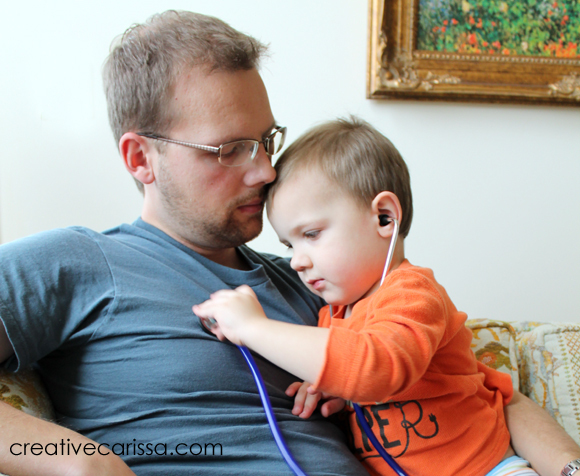 The Christmas that my son was two, he said he only wanted Santa to bring him one thing for Christmas: "A doctor kit with a stethoscope." I'm not even kidding. Whose two year old asks for something that sophisticated? Since he really only asked for one thing, I wanted to get him one. The problem? Most kids doctor kits are $20-$30 and full of little plastic do-dads. And none of them do anything. I have major hang ups about paying $30 for a small collection of junky plastic do-dads. He also specifically asked for a doctor kit with a stethoscope in it -- and I knew if it didn't work, he was going to be pretty disappointed. So I did what any crafty mom would do: I decided to assemble my own kids doctor kit with as many (safe for toddlers) working things as possible. If you have your own budding doctor at home, they will love having a doctor play set with parts that actually do things. The best part is that by assembling my own doctor play set, I ended up with a way cooler doctor kit than I would have if I had bought a kids doctor kit full of junk - but for the same price! So I did not actually save money over buying a toy doctor kit from the store, BUT I got stuff that is way cooler for the same price I'd have paid for a box of useless shaped plastic pieces. Considering that this kit has survived six years and two different kids, I'd say it was worth it! 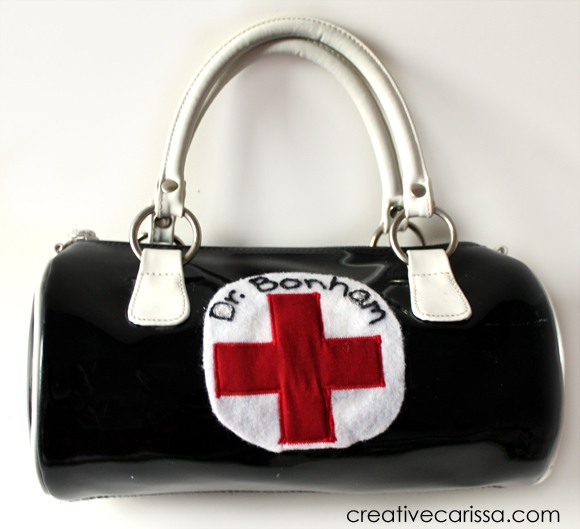 The doctor bag I made for the doctor play set actually used to be my favorite purse from college. It did create a smidge of heartbreak to turn my fave sentimental purse into a kids toy but the honest truth is that I have not actually used the purse since maybe, oh, 2005 (the layer of dust I had to clean off of it will attest to that, ahem) and chances that I will be using such a small purse any time in the future is slim. 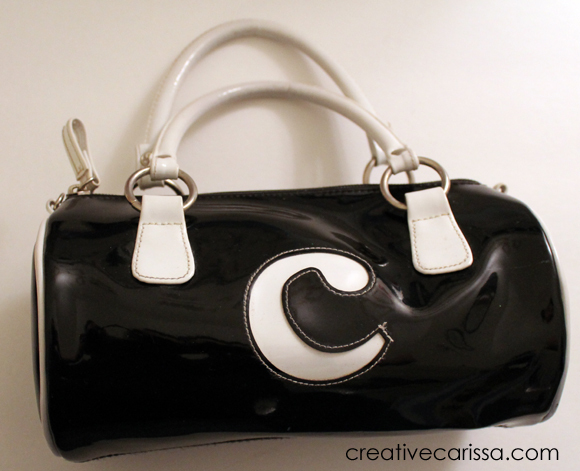 It also had the best shape for a doctor bag of any of my old purses. Below are the items I bought to fill the play doctor kit (you can click the image to go directly to the item for sale on Amazon). We already had the medicine bottle at home. While I didn't end up including this in the kit I made for my son, I also think this doctor dress up set with kid sized scrubs and a lab coat would be an awesome addition to this doctor kit. Check it out here on Amazon. My son LOVED this kit. He was particularly enamored with the bandaids - everyone including one of our fluffy dogs has fallen victim to "Dr. Bonham's" attempt at nursing them back to health with the power of kisses and bandaids. 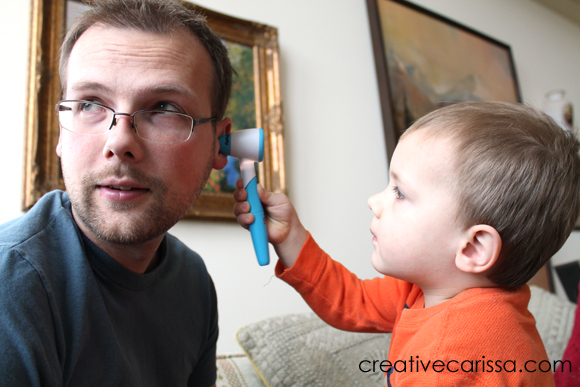 It has also become common to have to explain to grandparents, babysitters, store clerks, etc that my child isn't really injured. He just likes bandaids. So cute!! My boys BOTH love doctors kits. I will have to try for a great one like this rather than spending more cash on crap! Thank you so much!!! I was feeling frustrated looking at plastic-y dr kits on line for my daughter's 3rd birthday. Thanks to your great idea and great pictures/resources, I'm almost done creating hers on my own! Thanks so much!!! My 3 year old daughter wants a dr kit for her birthday, but I was getting so frustrated looking at the crappy plastic ones. This is a wonderful idea! Thanks to your idea/resources, I'm well on my way to making my own for her. My grandson still has almost all of his Fisher Price Dr. kit left. He's 4 and was playing with grandpa. They were having lots of fun but I saw the limitations of the kit so I thought I'd enhance it with a few extras, like a real stethoscope. Looking on Pinterest I found this link for x-rays from Net Places, http://www.netplaces.com/kids-mummies-pharaohs-pyramids-puzzles-activities/high-tech-meets-the-mummy/close-encounters.htm. You can get a customized eye chart and novelty prescription here http://www.eyechartmaker.com/. 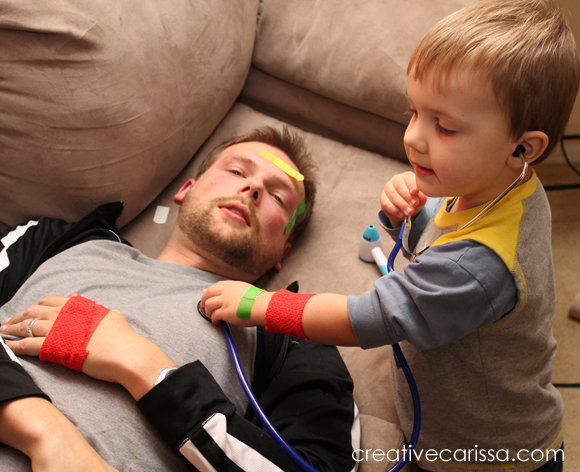 This person has an idea for a pretend cast, http://www.sewcando.com/2010/03/doctor-is-in-felt-play-set.html. Don't forget their ID badge too. I'm also making some felt & velcro bandages for the stuffed patients. You might be able to come up with a white "Dr's coat" also. You can check the thrift & charity stores for something you could alter to fit. I'm sure there are other items that I can find. I'm going to look on Pinterest for more ideas too. I can't wait for my grandson to come back. 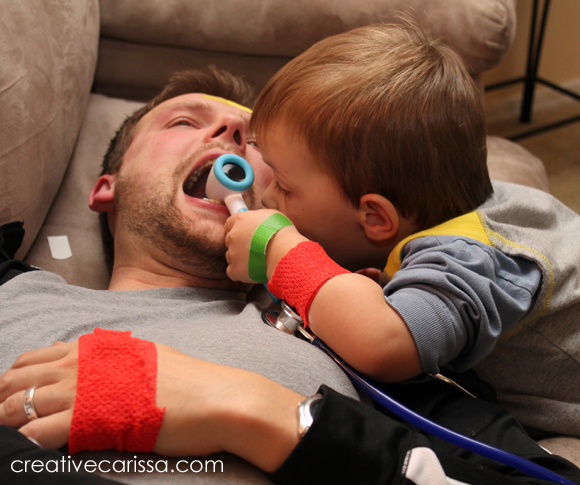 He was so serious and precise in how he took care of his patient. I'm going to remember the camera next time. These are great ideas! My grandson isn't quite old enough yet but by next summer or fall he will be the perfect age! I think my favorite picture is the one of the dr. and patient with the bandages!